We have been having some really cold although often quite beautiful days (not including today!) lately. Whem its fine but icy cold the view is just magnificent at the farm. 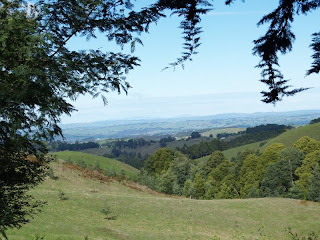 From here we can see Wilson's Promontory, to the south east but also Western Port Bay to the west. The wattles are about to flower, and the daffodils are popping out of the ground again (there once was an old house on this property and around here where there were houses there are daffodils) - this year I want to dig some of them up to transplant around the new garden beds I'm working on. 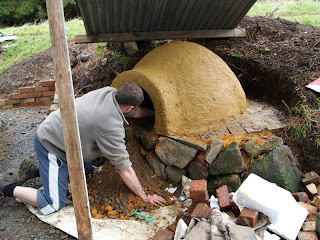 We have been working on the pizza oven again. Yesterday we applied a layer of clay, sand and straw, which ended up being about 5-10cm thick (2-4in). The straw is supposed to act as an insulating layer, as well as helping to reinforce the mud. We also dug out the sand mold from inside the dome, and thankfully it didn't collapse!!! Cows 'broke into' our place last week, and thankfully didn't destroy the oven - they actually ran up next to it, and scuffed the surface!!! It could have been a disaster. For some reason around here nobody seems to care if their cattle are roaming about on other people's land (the same can't be said about goats, as my neighbour called me at 7:30am to let me know about our old goat Cookie wandering about in his paddock...). This last mob of cows destroyed the drains on the shed site (where we are going to build a strawbale or mudbrick shed/office), so since all the rain we have had has become a bog... They also ate more trees and generally made a mess. I used to love cows, but I am starting to lose patience with their destructive ways. Crafts around here are mostly in the relm of my imagination. Our little girl just does not sleep much. No day naps (she gave those up almost 6 months ago) and goes to bed not much earlier than I do and wakes us up in the morning with demands for 'honey toast'. I am still spinning most nights for an hour if I am lucky, so it takes me about a week to spin 2 bobbins and ply them, but some progress is still better than none - right? Hi Sharon good to hear your pizza oven survived as im looking forward to seeing you homemade pizzas!! I cant wait to see your vest i decided im going to try to fair isle a couple of my handspun/ knitted beanies - so now ive got to spin up some white leicester and then ill start - i hope it turns out good as i want to enter in our local show in october this year.